The Surge is perfect for long bombs, yet still highly controllable for virtually all skill levels. 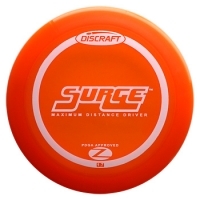 Everyone will benefit from the extra glide the Surge delivers in calm to moderate wind conditions. Controlled distance has a new name! Notable: Excellent for long bombs, yet still highly controllable. Your next go to driver! This Product was added to our catalogue on Monday, 16. May 2011.